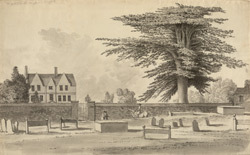 This mature cedar tree lies outside the churchyard in Illington, Norfolk. The building in the picture is probably the church rectory. The parish is small - containing just over 100 people by the mid-19th century. The church nearby is dedicated to St Andrew.